From January 2003 until June 2004 Colin worked in the Institute of Byzantine Studies Queen's University Belfast as Artist in Residence. The primary mission of this residency was to work in partnership with the Institute and The Naughton Gallery at Queen's to develop and transform an enclosed internal courtyard of the faculties premises. 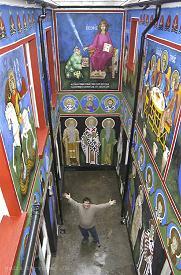 This was achieved with the design and creation of a series of meta Byzantine wall murals. The artist worked closely with staff and students on all stages of the project and contributed to a web log about the project showing the day by day progress. He also videotaped the entire project and edited and produced a documentary DVD of the project. Below are photos of the courtyard before and after the project.